A number of ethnic and religious groups have taken advantage of this vacuum to seek control over their own affairs. In several regions, their demands have resulted in conflict. Leaders in these regions have tried to gain control over the conflicts and bring them to an end. The test for many leaders has been how to preserve law and order without returning to the undemocratic rule of the Soviet era. Among the different subregions of the former Soviet Union, the Caucasus has experienced some of the most violent conflicts. The Caucasus, or Caucasia, is a region that straddles the Caucasus Mountains, which stretch between the Black and Caspian seas. To the north of the mountains lie republics that are part of Russia—including Chechnya, Dagestan, Ingushetia, and North Ossetia. To the south are the republics of Transcaucasia, which were once part of the Soviet Union but are now independent countries: Armenia, Azerbaijan, and Georgia. The Caucasus is a land of great complexity. Inhabitants of the region, which is about the size of the state of California, speak dozens of distinct languages and belong to approximately 50 different ethnic groups. As the Soviet Union began to break up in the late 1980s, several of these ethnic groups began to take up arms to win their own independent territories. In the following decade, hundreds of thousands of people died in the conflicts that resulted. Among the republics that remained part of Russia after the collapse of the Soviet Union, Chechnya has experienced the worst violence. In response to Chechnya’s demand for independence, Russia invaded Chechnya twice in the 1990s, causing over 100,000 casualties. Russia first invaded Chechnya in 1994. By the spring of 1995, Russian troops were in control of more than two-thirds of the republic’s territory, and they had captured the capital, Grozny, and other major towns. But Chechen rebels continued to fight from hideouts in the surrounding mountains. Unable to defeat the rebels, Russia reluctantly entered into a peace agreement with Chechnya, ending the first phase of the war in August 1996. Russia invaded Chechnya again in October 1999. The invasion began after a series of bombings in Moscow and other Russian cities that Russian leaders blamed on Chechen terrorists. The invasion continued into 2001. As of that time, no one was certain when the conflict would end. Russia is not the only former Soviet republic that has experienced instability. The Ossetian people living in the central Georgian region of South Ossetia fought against Georgian troops off and on from 1989 to 1992. They wanted to unite South Ossetia with North Ossetia, located in Russia. This violent struggle resulted in 2,000 deaths and over 40,000 refugees before a truce put an end to the conflict in June 1992. Following the truce in South Ossetia, another violent conflict erupted in Abkhazia, a once-popular resort region in northwestern Georgia. Abkhazians declared independence in July 1992. In the following months, they forced Abkhazia’s Georgian population—over 250,000 people—to leave the region. Many died while crossing snow-covered mountains to safer areas. By September 1993, the Abkhazians had driven Georgian troops from the region. In spite of their success, Abkhazia still lay in ruins in 2001. And the fate of the Georgian refugees remained to be settled. Conflict has also plagued the region south of Georgia, where Armenia and Azerbaijan fought over a mountainous area of Azerbaijan called Nagorno–Karabakh. Leaders in Azerbaijan say that the region’s history proves that Nagorno-Karabakh belongs to them. 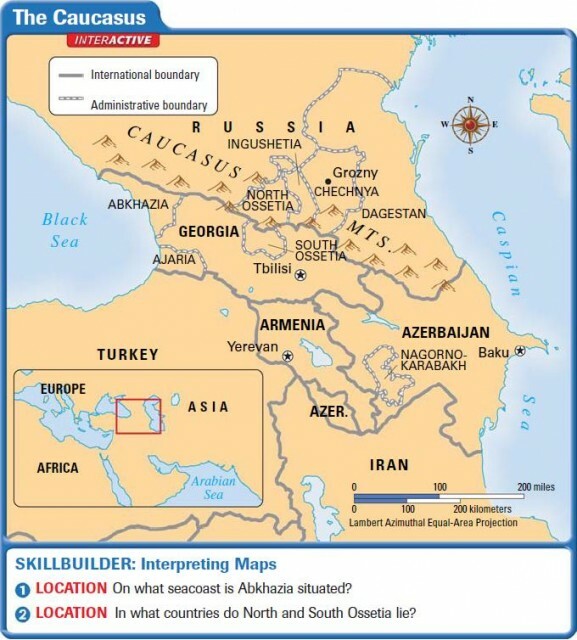 Armenia claims Nagorno-Karabakh because over three-quarters of its population is ethnic Armenian. The dispute began long ago and was raging in the early 1920s, when the Soviet army took control of the region. Soviet authorities kept the dispute under control until the late 1980s, when Armenians and Azerbaijanis began to fight for control over the region. The fighting continued on and off for nearly six years. Eventually Armenia won control of the territory. A ceasefire was declared in 1994, but by then, tens of thousands of people had died. Nearly a million had become refugees. Hope on the Horizon? In spite of all this conflict in the region, many believe that there is some hope for the future. In April 2001, U.S. Secretary of State Colin Powell hosted a round of direct talks between the presidents of Armenia and Azerbaijan. The talks, which were held in Florida, were aimed at reaching a lasting peace settlement between the two nations. However, as of 2005, the dispute had not been resolved. Fighting has continued in Chechnya, and the human costs of the war have continued to mount. In February 2001, Russian officials reported that more than 15,000 soldiers (2,700 Russians and 13,000 Chechen guerrillas) had died since the second war began. Public support for the war, which was high when it began in October 1999, is now declining. The economic costs of the war have also become a burden. These factors may help to bring an end to the conflict. In the next section, you will read more about the economic challenges faced by Russian leaders since the fall of the Soviet Union.